It was a full court press at the annual general meeting of the Weston Village Residents’ Association (membership of almost 100 apparently). Mayor John Tory had agreed to attend along with the president of Artscape, Celia Smith and all three of our political representatives. The meeting was no doubt sold to His Honour as an opportunity to bask in the approval and gratitude of residents. After all, aren’t we getting a wonderful new cultural hub? 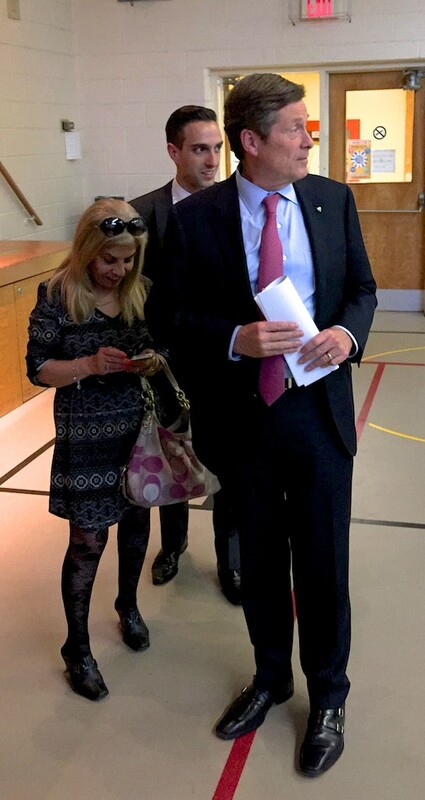 Mayor Tory checks out the audience. The elephant in the room was a giant middle finger (ok enough metaphors) seemingly directed at the people of Weston in the form of a 30-storey rental apartment building; allegedly the unavoidable price of getting the hub. Despite organizers’ best efforts (I was in the second row yet somehow invisible when I raised my hand) a couple of awkward questions were asked about the latest tower proposal and judging by the spontaneous applause, a growing concern is shared by many in the audience. This latest rental apartment in Weston seems destined to become like the others (only taller). Was it necessary to sell the old GO Station parking lot to a developer? Why didn’t the negotiating team look at retaining the site and developing a decent Wychwood Barns type space with parkland and no 30 storey rental apartment building? Costs could have been amortized over years rather than all at once. What did 33-35 King bring to the table to offset the costs of developing the hub since they stand to gain millions from this in rents, parking charges and a more valuable building? The ‘Podium’ – Who owns it and what did they bring to the table? Click for expanded view. Was Rockport the only developer asked to submit proposals? If not, who else made proposals and why were they rejected? Is the current deal the best the negotiating team could make? Who was on the negotiating team? Metrolinx paid $1 million to be applied to the purchase of the additional land to the south of the TPA lot. The City ended up purchasing the lot in a separate deal. What will happen to the $1 million? Where is it now? Why was this information withheld from the public? Were the highest ethical standards applied in making this deal? Why is extracting information about this project so difficult? Until the public gets answers to these questions (and others) we are working in the dark and cannot provide an informed consent to this project (if that was ever an option). Let’s have some daylight on this, please.